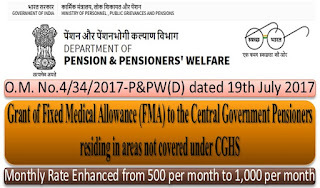 : Government enhanced the amount of Fixed Medical Allowance from Rs.500/- to Rs. 1000/- per month. It will take effect from 01.07.2017. Khan Market. New Delhi-110 003. 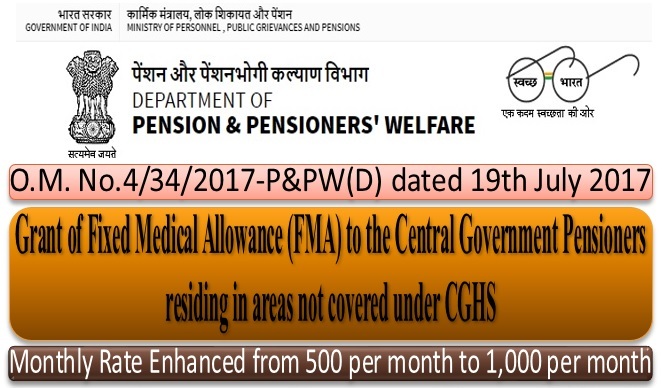 Subject: Grant of Fixed Medical Allowance (FMA) to the Central Government Pensioners residing in areas not covered under CGHS. The undersigned is directed to say that at present Fixed Medical Allowance (FMA) is granted to the Central Government pensioners/family pensioners residing in areas not covered under Central Government Health Scheme administered by the Ministry of Health & Family Welfare and corresponding health schemes administered by other Ministries/Departments for their retired employees for meeting expenditure on their day-to-day medical expenses that do not require hospitalization. Orders were issued vide this Department's O.M. No. 4/25/2008-P&PW(D) dated 19-11-2014 for enhancement of the amount of Fixed Medical Allowance from Rs. 300/- to Rs. 500/- per month w.e.f. 19.11.2014. 2. Consequent upon the decision taken by the Government on the recommendations of the 71th Central Pay Commission on Allowances (with modifications), sanction of the President is hereby conveyed for enhancement of the amount of Fixed Medical Allowance from Rs.500/- to Rs. 1000/- per month. The other conditions for grant of Fixed Medical Allowance shall continue to be as contained in this Department’s OMS No. 45/57/97-P&PW(C) dated 19.12.71997, 24.8.1998, 30.12.1998, 18.8.i999 and OM No. 4/25/2008-P&PW(D) dated 19.11.2014. 4. In their application to the persons belonging to the Indian Audit and Accounts Department, these orders issue in consultation with the Comptroller and Auditor General of India vide their UO No. 169-Staff (Rules)/A.R/Ol-2016 dated 18.07.2017. 5. These orders are issued with the concurrence of the Ministry of Finance (Deptt. of Expenditure) vide their OM No. 11-1/2o16-IC dated 11.07.2017.